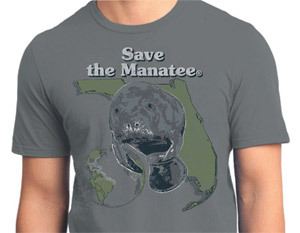 Note: High resolution images of manatees and the Save the Manatee Club T-shirt are available upon request. When you Adopt-A-Manatee at $35 or more, you’ll also receive a FREE Club T-Shirt. Looking for a unique gift this Father’s Day? Forget the ties and socks – adopt a manatee! For $25, Save the Manatee Club (SMC) will send your dad an adoption certificate, photo, and life history of a real living manatee. Adoptive “parents” will also receive updates on their manatee in the Club’s quarterly newsletter as well as a subscription to Paddle Tales, the Club’s bi-monthly enewsletter. Or for $35, each new member who joins the Adopt-A-Manatee program will also receive a free T-shirt with a manatee design on front and the Club’s logo on back. Either way, a manatee adoption is a perfect gift for a dad who is wild at heart. Select from 34 manatees up for adoption including possible favorites for dad such as Whiskers, Gator, Doc, Rocket, and Brutus. See photos and a list of the manatees available for adoption at savethemanatee.org/adoptees. Whichever manatee is chosen, adopting one helps them all. Funds from the adoption program go toward Save the Manatee Club’s mission to protect manatees and their aquatic habitat. Manatees are Florida’s official state marine mammal and are gentle, slow-moving animals. They have no natural enemies, and it is believed they can live 60 years or more. However, a high number of manatee fatalities are from human-related causes. Most human-related manatee fatalities occur from collisions with watercraft, and 2016 was a record year for boating-related manatee deaths. Other causes of human-related manatee mortality include being crushed and/or drowned in canal locks and flood control structures; ingestion of fish hooks, litter, and monofilament line; and entanglement in crab trap lines. Loss of habitat is also a serious threat facing manatees today. Save the Manatee Club is a nonprofit conservation organization, established in 1981 by singer/songwriter Jimmy Buffett, and former Florida Governor and U.S. Senator Bob Graham. The Club works reduce the negative impacts to manatees and their aquatic habitat caused by human activity through increasing public awareness and education; sponsoring research, rescue, rehabilitation, and release efforts; advocating for strong protection measures, such as boat speed zones and sanctuaries, and taking legal action when appropriate. To adopt a manatee for Father’s Day, contact Save the Manatee Club at 500 N. Maitland Ave., Maitland, FL 32751, call toll free at 1-800-432-JOIN (5646), or visit the adoption page at the Club’s web site. Shop for manatee-related gifts at shopsavethemanatee.org. Watch video of manatees from this year’s season on their Blue Spring webcams at ManaTV.org.